The British Gazette » The Badmouthing Britain Collective: Discrediting our national heroes. 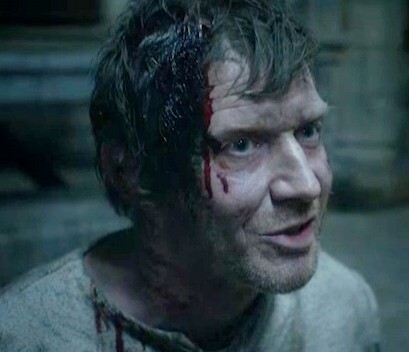 Above, the actor Jason Flemyng as King Edmund in The Last Kingdom. It could only happen to the English! They would not dare do it to the Irish! They would not dare do it to the Scots! They would not dare do it to the Welsh! And so far as any of the “ethnic minorities” are concerned: Goodness Gracious Me! NO WAY!!!!!!!!!!!!!!!!!!!!!!!!!!!! We are all fair game. Even our national Saints! Last night at 9:00PM on BBC2 a new drama was screened. This was episode 2 of “The Last Kingdom” This featured the death of an English national hero and a Christian Saint. St Edmund – King of East Anglia. The Saint was brutally martyred by the heathen Danes. The BBC portrayal of the saint grotesquely downplayed the martyrdom. It made the saint out as a sort of Quisling figure. But then, what do you expect from the Badmouthing Britain Collective! Of course, for the BBC it is all in a day’s work! And to add insult to injury: We are taxed to pay for this!